The Triumph Roadster sports car. 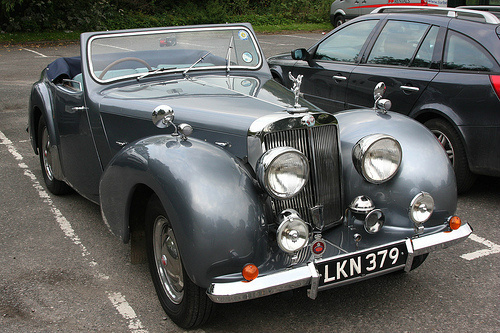 This was the first car produced by the Triumph Motor Company after the end of WW2, and just before it was acquired by the Standard Motor Company. Its design dated back to the classic tourers of the 1930's. 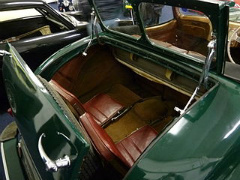 It even had what was described as "Dicky Seats", which would now be called occasional rear seats. Accordingly, the car could be best described as a 2+2. At that time, Standard wanted to produce a car that would compete with Jaguar, which had been using Standard engines in the pre WW2 era. Owing to the post war shortages of steel, the body would be made of aluminium. The chassis was welded by hand from steel tubing, and was a shorter wheelbase version of that used in the Triumph 1800 saloon. There was independent suspension at the front, and a live axle at the rear. 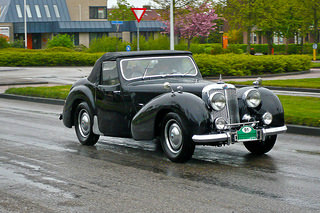 It used a 1.8 litre engine which was based on a 4-cylinder, 1.5 litre Standard unit which Jaguar had also been using. It used a four speed gearbox with synchromesh on the top three gears. It incorporated a bench seat which was supposed to accommodate three people. As a result of this arrangement, a column gear change was necessary. It had large protruding headlights, a feature that would soon be dispensed with in future. As a nice touch in those early days, even a step was provided on the rear bumper to help with getting in and out of the dickey seat. There was also a folding windscreen in front of this seat for added passenger protection. Since the car was exceptionally wide at 64 inches, this necessitated in the fitting of three windscreen wipers in a row. In 1949, the car was updated by the addition of a 2 litre engine, transmission and back axle from the Standard Vanguard. However, a surprising move was the inclusion of a three speed gearbox. Even though this had synchromesh on all forward gears, it was still seen as a retrograde step. The car was, essentially, made by hand, which was reflected in the fact that only 2,501 units of the 1.8 litre, and 2,000 of the 2 litre versions were built. 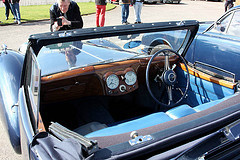 Surviving examples of the Triumph Roadster are still in demand, and represent a fine example of a classic car. Today, this manifests itself in the popularity of classic car restoration.